Onamalu and Malli Malli Idi Rani Roju are films with good sensibilities. Tell us about how they paid at box office? Onamalu didn’t do well at box office. Onamalu was a good teacher. I have learnt the technique of filmmaking. It was very different from what we learn at film school. MMIRR was like a liberation. I could do whatever I wanted to do. It’s an Utopian set-up story written with ‘what if’ point of view. I got a lot of applauses. It gave me happiness. What is the reason for doing a commercial film like Ungarala Rambabu after doing a couple of well-meant sensible films? Onamalu and MMIRR were emotional stories. I am an emotional guy. I get carried away by emotion. I strongly believe comedy is a big emotion. Everybody has a tickle bone. Sunil has done over 400 films as a comedian. When I got an opportunity to a film with Sunil, it was bound to be a comedy film. Getting emotion into a Sunil’s film was tough, but we achieved it. What is Ungarala Rambabu film all about? Story of Ungarala Rambabu is inspired by a quotation by people’s poet and Padma Vibhushan Kaloji Narayana Rao - “Naa nunchi Maa varaku. Maa nunchi Manam varaku”. The story of the film is about the character travel of a greedy guy who ends up fighting for others. There is also another quote by Kaloji - ‘Jananam Needi. Maranam Needi. Bratukantha Desamdi’. These two quotes influenced me to write Ungarala Rambabu story. Ungarala Rambabu is a film where Sunil’s comedy will not be missed and my sensibilities will not be missed. It has a perfect balance. Theatrical trailer suggests a serious second half? The crux of the story happens in the second half. But there is a nice humor play between Prakash Raj (father of heroine) and Sunil characters. Though Prakash Raj plays a righteously guy who fights for the rights, he also has some humor angle in this film. How did you blend comedy timing of Sunil with social cause in this movie? Let's take the example of Charlie Chaplin. His get-up, mannerisms, body language and acting style is same in all the films. He is the greatest comedian in the world. What made the difference is the stories he pick. ‘The Kid’ film talks about child labor. His film ‘Machine Tools’ predicted that we will become slaves to technology in the future. Ungarala Rambabu is a kind of story that has comedy actor like Sunil, but takes on a social issue. What’s the reason behind casting Miya George? I was watching an awards function on YouTube and it went into autoplay and played a dance performance of Miya George. I liked her dance and the way she expressed through eyes. I did some research and found that she is already an actress in Malayalam. She was a natural choice and she has performed well. Why did you choose Kerala backdrop for the heroine and second half takes place in Kerala? 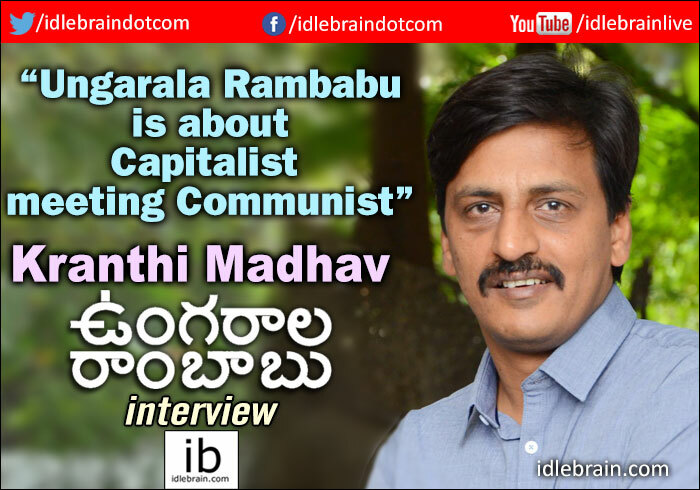 The story is about a capitalist (Sunil) meeting communist (Prakash Raj). We wanted communism dominated area for second half. Since Kerala is ruled by communist government, I thought Kerala is the right backdrop for Prakash Raj character in the film. How is it like doing a commercial formatted film like Ungarala Rambabu? Anything that is sold at box office or any film that is bought at a price is a commercial cinema. My earlier films were also commercial films. A part of Ungarala Rambabu is a templated film. But, what matters here is the emotion. I am telling a serious message in a lighter vein. All three films you have done are of three different genres. Is it intentional? No. It was just a coincidence. Writing and shooting is strenuous. Editing is chaos. I plan to retire after 10 films. I feel good that I got a chance to direct the toughest genre - comedy so early in my career. My next film will star Vijay Sai Deverakonda and it will be produced by KS Rama Rao. It’s an urbane love story with strong characterizations. Major part of the story happens in USA and Europe. The shoot is likely to start in February 2018.